As his 31st birthday approaches, University of Hartford professor Taylor Thatcher - unsuccessful in love, haunted by guilt, burdened by family history, and emotionally immobilized- finds his past and present converging in bewildering ways. His younger brother, Bin, has taken to mysterious disappearances; a charming young photographer, Miryam, becomes an unsettling new presence in Taylor's life; Taylor's ex returns from Mexico, engaged, pregnant, and accompanied by her fiancee; and Esther, the woman who raised Taylor, divulges startling new information about his family. In order to find love, purpose and sense of belonging in the universe, Taylor must reconsider his legacy and open his heart to the possibilities of the future. [My grandfather] would correct me when I referred to the Thames as a 'river.'... "Down here, we call it an estuary. A Tidal estuary. It's where the river shakes hands with the ocean and the earth nods to the moon." His correction came with a sparkling smile that bounced right off the water; but the difference seemed to matter greatly to him, as if something important hung in the exchange of sea salt and river water, something more than the slow swing of the boats moored in the alternating tides off Mamacoke. Taylor's family inheritance, like most family inheritances, is both good and bad. There are old truths to reinterpret with new evidence, long kept secrets that must come into the light. While Taylor frets, those around him seem to not only cope but flourish and transcend, creating new bonds and relationships. A kind and gentle future awaits Taylor, if he can only bring himself to embrace it. I was impressed with the richness of this novel, the depth of history, of introspection, and of language. An internal shift and narrow span of present time become broad and lush and complex as the story traverses history. Reading was like navigating the folds of a curtain: for each inch of visible fabric, there is a foot of material tucked behind. This folded structure starts off just a bit obviously, with a noticeable tiering of paragraphs early on, but it became more elegant and seamless over the course of the novel, and by the end I was just caught up in the flow. Wheelwright builds suspense by hinting at key events but only revealing them later - a good thing, though with the back and forth, for a moment I thought I'd missed a crucial plot point (as it turned out, I should not have feared). The novel concludes just as the reader hopes, and leaves one with a profound sense of connection to family lineage, history, the landscape, and even the cosmos. We are who we are not only because of all who came before us, we are also shaped by the land beneath our feet and the stars above our heads. I focus on a bright sun, not ours, and hold it hard in sight. I imagine it to be the one farther away, Triangulum, equidistant from Miryam, Evangeline, and me. I wrap myself around that distance as if, by sheer force of will, I might reach beyond what I can't see. Time folds. I am back on the porch steps, back in the Deacon's ruined Garden. A short time ago, but as far off as my sun. The stars begin moving, drifting apart and swelling with light. Shooting. They streak and flash across the sky, returning and fusing one to the other before flying apart again like shattered atoms...I smile to myself, the lens of welling tears. Gone come 'round again. I highly recommend this review over at Unabridged Chick, from whom I first learned about this book. You can learn more about Peter M. Wheelwright at his website. 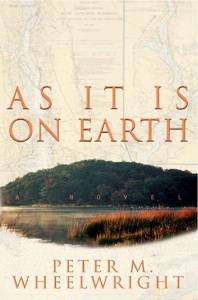 Many thanks to the author for a complimentary review copy of As It Is On Earth. I'm so glad you liked this one! Sounds fascinating! Thanks for the review.